Some describe them as momentary zaps, others as pulsing surges, but all who experience electric shock sensations know them to be uncomfortable and disruptive no matter when they occur. Many who experience electric shocks are unaware of their cause or how to treat them. Read on to discover six little-known facts about electric shocks that can help you manage them. Due to their relative rarity and sporadic nature, scientific research on electric shock sensations is still in progress. Though strong hypotheses exist for its causes, this condition is intertwined with different bodily functions, making it difficult to pin down concrete reasons for it. 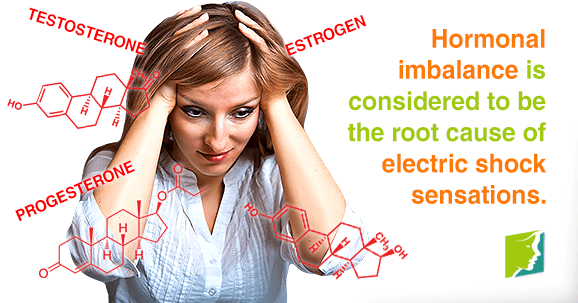 Despite a lack of clinical evidence, hormonal imbalance is widely considered to be the root cause of electric shock sensations, particularly in women going through menopause. Estrogen levels, which fluctuate and decrease during menopause, are intrinsically linked not just to the reproductive system, but also to brain function. It is thought that a miscommunication between estrogen and the nervous system can cause this disruptive feeling. Electric shock sensations can occur at any time, with no preceding symptoms. Many women report, however, that episodes are often immediately followed by hot flashes. This data adds to the theory of an estrogen-related trigger, though some medication for treating hot flashes is known to worsen electric shocks. Though not exclusive to menopausal women, electric shock sensations are certainly more prevalent in older individuals. The first signs of the problem generally occur during perimenopause, the first stage of the menopausal change. Factors such as bone degeneration and osteoporosis, which are more common later in life, can also play an important role in its appearance. Proper nutrition is always important, but it becomes essential when dealing with electric shock sensations. A lack of vitamins B12 and E, calcium, potassium, magnesium, and omega-3 fatty acids has been linked to more frequent electric shock episodes, so a balanced diet can do wonders for protecting against these incidents. Often simple lifestyle changes can make a big difference in the frequency and intensity of electric shock sensations. Adding more variety to a healthy diet and maintaining a regular aerobic exercise routine might be all that's necessary to find relief. If shocks remain an issue, natural hormonal supplements can help treat menopause symptoms at the source by supporting estrogen production in the endocrine system. As a last resort, hormonal replacement therapy (HRT) may be considered. There is still much to learn about electric shock sensations, but a good understanding of the existing information is key to finding relief. Armed with this information, you can feel more confident in talking to your doctor about a plan that will work for you to eliminate this uncomfortable symptom. For further information on electric shock sensations and other menopausal symptoms, follow this link.